Cut the fish into medium size and wash it carefully. Marinate with 1/2 tsp turmeric and a pinch of salt. Prepare the masala: In a saucepan, dry fry cinnamon, cloves, cardamom, black pepper corns &, coriander powder, red chili powder, 1/2 tsp turmeric powder & bay leaf for around 3-4 mins in low heat. Add shredded coconut and stir well for another 2-3 mins. Take this off from the heat and wait to cool. Blend this masala to make a fine paste. Add little bit of water if required. In an another deep saucepan, heat oil. Add sliced onion & garlic and sauté till lightly browned. Add green chilies, ginger julienne and tomato and saute for another 2-3 mins. Add blended masala and cook this for 4-5 mins in low heat. Stir occasionally. Transfer this masala into a small bowl and keep this aside. In the same saucepan, add tamarind pulp and carefully place the fish pieces. Add water and cook this for 5-10 mins in medium heat. Transfer the prepared masala into this and stir slowly. Cook it for another 2-3 mins. 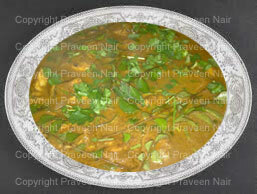 Season your dish with coriander leaves or curry leaves. Serve hot with Veg Pulav or Steamed Rice. Cut the fish into medium size pieces. Wash it and add turmeric powder and keep aside. Put tamarind into ½ cup of water. Now put fish into a kadhai and pour the tamarind pulp and salt into this. Cook it for 5 min. In the meantime blend grated coconut, red chillies, coriander seeds and turmeric powder. Make a thick paste. Heat the kadhai or pan and pour oil. Add chopped onion and fry it till golden brown. Mix it with the thick coconut paste. Transfer this into the kadhai and stir well. Add salt if required. Close the lid and cook it for 15 mins in medium heat. Don’t forget to check the taste in between. When the gravy is getting thick its ready to serve. 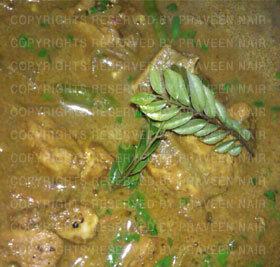 Season your dish with coriander leaver or curry leaves. Serves hot with Veg Pulav or Steamed Rice.